Inside the nose of a shallow well jet pump there is a nozzle and venturi pair. The nozzle blows water through the venturi which creates a pressure differential. It’s this pressure differential that actually helps the pump build pressure. It’s kind of the same physics principal used in a jet engine. Jet pumps are mounted above the well, either in the home or in a well house, and draw the water up from the well through suction. Because suction is involved, atmospheric pressure is what's really doing the work. Think of the system as a long straw. Jet pumps come in both shallow and deep well versions. 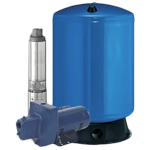 Like the name says, submersible well pumps take the pumping power to the source, down the well. A typical submersible pump is characterized by a long cylindrical shape that fits inside the well casing. The bottom half is made up of a sealed pump motor that is connected to the above-ground power source and controlled by wires. The actual pump half of the unit is comprised of a stacked series of impellers, each separated by a diffuser, that drives the water up the pipe to the plumbing system. In many areas of the country, the water table is only several feet below the surface of the ground. In such a shallow-well situation, lifting the water up to the house is going to be a little easier, if only because the distance you have to move it is modest. In general terms, shallow wells are designated to be about 25 feet or less in depth. Both submersible and jet style pumps can be used in shallow well applications. If your area doesn't have a high water table, or if it lacks a stable supply of potable water near the surface, you must dig deeper to achieve the same result. And because a deep well means that the water has to be lifted farther, the strategies for moving it changes. When using a jet pump in a deep well application, it simply involves separating the jet from the motor and impeller housing and placing the jet assembly down in the water. In a typical deep-well jet-pump configuration, one pipe mounted to the impeller housing drives water down into the jet body that's located about 10 to 20 ft. below the minimum well water level. A second pipe connects the output side of the jet body back to the pump. At the jet, the increase in water velocity creates the partial vacuum that draws standing well water into the second pipe and then back into the pump and plumbing system. Deep-well jet pumps use both the suction at the jet to bring water into the system and pressure applied by the impeller to lift the water. While a jet pump can reliably handle a well several hundred feet deep, a more effective solution is to move the pump down into the well so, instead of lifting the water, it's pushing it up. Because each well has unique characteristics, let the experts at Van Contracting, Inc. help explain all the details and customize a solution that's right for you.